Maj Mohammad Kiggundu murder suspects appear before court during a past hearing. Courtesy photo. Suspects accused of killing Sheikh Maj Mohammad Kiggundu and his bodyguard, Stephen Mukasa, have Wednesday been committed to the High Court. The four suspects committed to the High Court are; Sheikh Yahaya Ramathan Mwanje, who was the acting Tabliq sect leader at Nakasero Mosque in Kampala; Muhammad Buyondo alias Matiya, a boda boda rider; Abdul Wahabu Sedegeya,also boda boda rider and Musa Sekandi, a businessman in Masanafu, a Kampala suburb. This is after the Director of Public Prosecutions Mike Chibita informed court he was had enough evidence to pin the accused on the murder of Kiggundu. The four and others are charged with terrorism and murder. According to court documents, Sheikh Mwanjje, Buyondo, Wahaab and Ssekandi are accused of supporting ADF rebels in form of training and recruitment between 2010-2017 in various districts of Uganda. Other suspects are Yusuf Nyanzi, Jibril Kalyango, Noordin Lutaaya, Bruhan Balyejusa. 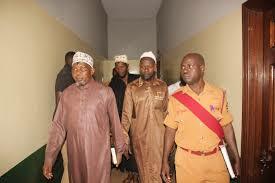 The eight are jointly charged with the murder of Sheikh Maj. Kiggudu and his bodyguard.